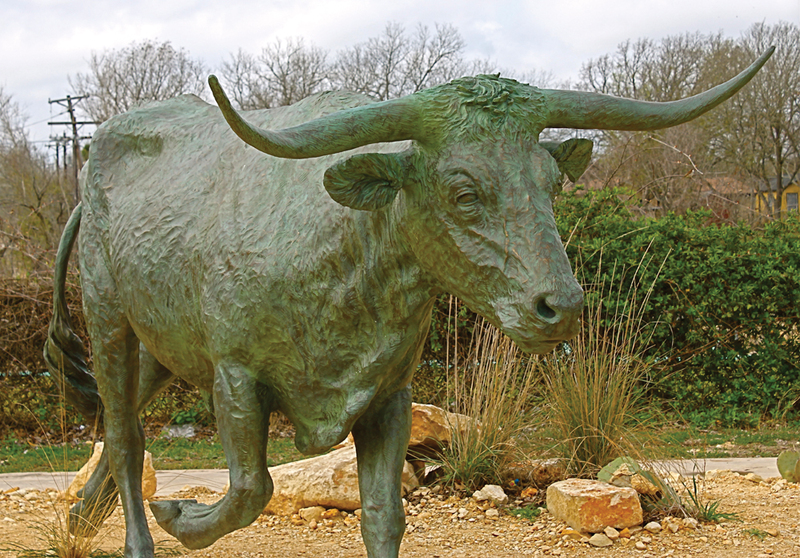 Boerne is a small Hill Country town that is sort of a miniature version of Fredericksburg. Or perhaps Fred is Boerne on steroids. Both are the shop-till-you-drop kind of places that can keep women occupied all day. I can’t shop. Like most humans, I was born with the shopping gene. However, like most men, I decided early in life to sacrifice the shopping gene in exchange for a special gene that allows me to go to the bathroom alone and to find my way in and out quickly. I think it was a good trade. Normally, I would find a local watering hole and stay there until the women-folk were satisfied with their day’s work and then we would all go on to The Creek restaurant for dinner. But this day was magnificent—a Hill Country Chamber of Commerce kind of day. I decided to instead sit with my girlfriend Maggie Mae (remember her? My Labrador retriever?) in the park and just watch people and maybe read a little. Of course, whenever that happens, it isn’t long before my thoughts turn to philosophical questions. The first topic that jumped into my head was happiness. After all, isn’t that just about everyone’s No. 1 concern in life? It certainly has been a hot topic among philosophers for at least the last two and half millennia; they all ask the same questions. Strangely though, I don’t remember reading many answers. That got me thinking. Why would there still, after all these centuries, be such an eternal seeking for truth, happiness and the meaning of life if the answers really existed? Surely after more than 2,500 years, someone would have stumbled on an answer. If any of the great minds did so, they never bothered to write it down. And if these guys couldn’t find the answers, why would I be so arrogant as to think I would be able to? That left just one option: one can only assume the answers simply don’t exist. When my thoughts lead to an unpleasant impasse like this, it always makes me uncomfortable and I usually try to escape by changing the subject—thinking about something else. Sometimes I get up and walk around to get my mind off it. But walking down Main Street with nothing but little shops selling things I have absolutely no interest in is not my idea of a good time either, so that would have been even more depressing. Instead, Maggie and I decided to just close our eyes and take a nap. I’m not sure how long it was; it felt like just seconds. I heard a loud click, almost like a door latch snapping into place. That woke me up. I looked at Maggie and saw that she, with her super hearing, was still out cold. I looked around at the few other people strolling through the park. No one else seemed to be disturbed by the sound either. I decided I must have been dreaming. Studying philosophy is a lot like trying to open a safe that is guarding a treasure. We want the treasure, in this case, the secret to happiness. But in order to get it we have to go through a series of very exacting steps in precisely the right order (left 16, right 34, left 22). Each number we dial in appears to do nothing, a tiny click at best. But in spite of that, we dial on because it is human nature to continue the quest for fulfillment. Sometimes that quest requires a journey that takes years—maybe even the bulk of our lives. Most of the time we get the numbers wrong and the safe remains solidly locked, holding the answers inside. It is only when each of the tumblers is properly activated, when everything is aligned precisely in its proper place that the door opens. I think that is what happened that afternoon. The click I heard was that last tumbler falling into place. And then, I finally understood. There were times in my life when I absolutely knew I was unhappy. I even admitted it out loud to a friend once, an act I consider to be extremely crass and almost never let happen. When I was unhappy, there was never a question about it. I knew it and felt it deep in every fiber of my being, 24 hours a day. But what about the rest of the time, times when I didn’t feel that way—when I wasn’t profoundly unhappy? Mostly, I felt nothing. I had no awareness of being either happy or unhappy. Sure, there were times of occasional ecstatic highs—times when I was in love, or had accomplished some goal I had struggled long and hard to gain. But I was always abundantly aware that these were momentary blips on the happiness monitor. They did not constitute true, long-term happiness—just a nice break from the dullness. Most of the time, there was nothing at all, no awareness of happiness or the lack of it. That is, until that afternoon in Boerne when I heard the click. Sitting there on the bench napping, the last tumbler clicked into place and years of searching finally came to fruition. The door to the safe opened. I never would have guessed its contents. The treasure I had searched for in vain for decades lay there before me. Looking inside, I saw the whole picture. I realized that, except for those times when I was clearly unhappy, I had really been happy all along—all those years. I know what you’re thinking—what is this lunatic talking about? Well, it’s really quite simple. When I felt nothing one way or the other, it was because I was really happy. The question is, why did I not realize that sooner. Why did I understand it now? There in the park in Boerne, I realized that happiness is like air…we are only aware of it in its absence. It is around us all the time. And like air, we take its presence for granted to the point where we no longer even notice it. As Maggie came awake, opening first one eye, then the other, I couldn’t help but smile. I thought about just how easy it is to determine if you are happy. If you have to ask yourself if you are happy, you are. And then a man, who for the first time knew that he was happy, joined the group for dinner at The Creek. Reading an article about happiness by Michael Gos!